I have lived in Boston for 15 years. Until last years move to the semi-burbs I took public transportation pretty much everywhere. For a few years I took the green line during rush hour, packed in like sardines. Then the #9 bus from Southie into Copley, and then the #7 from Southie into downtown all during rush hour times. I was a young professional, and I wasn't thinking twice about moms and kids on the T really. I have helped mother's get their strollers on the bus, and moved so they could better fit it out of the way in the handicapped seating. Maybe once or twice was I actually annoyed with a stroller on the T or bus, but only because it was in the way of the walk way and the mother wasn't apologetic at all. If they were audibly sorry they were blocking the way I didn't pay too much attention, and shimmied past them. But, I was, and will always be, one of those people that will immediately give up my seat if I see a mom, elderly or handicapped person. Even if I was in the window seat and the jerk next to me pretended to ignore the person in need of a seat, I would get up. I feel that the people behind all of this are not this type of rider. When I had M, she didn't stop me from going out and about on the T or bus, even in the frigid winter months when she was born. Most of the time (because she was so little and it was so cold out) I would strap her to me via Moby Wrap or Ergo under my winter coat. It was easier for me this way, as well as for everyone around me. When the weather got warmer, I learned the hard way about traveling on the bus with a giant UppaBaby Vista stroller. That sucker does not fit down the aisles - not even close. The first time I tried, I was getting on at South Station with a ton of other people, and I was horribly embarrassed as I was trying to jam this stroller down the aisle, knowing it wouldn't work, but I had nowhere to go. Someone thankfully ended up helping take the infant carseat off, and fold the massive contraption so that I could get out of the aisle, but the stroller was still in everyone's way. Every time after that I would make sure I was traveling at a less busy time of day, and that I could get a seat in the front sideways seats of the bus, and if I was especially lucky to have an empty bus, I could fold up the seat and put the stroller where the wheelchairs are supposed to go. Luckily a few months later we moved to the burbs, and now I drive everywhere. If I was to take the bus/train again with her I would use an umbrella stroller. But I have one child and I have the luxury of having the option to drive. Today an article in the Boston Herald was brought to my attention about a potential change in "pram policy" on the MBTA train and bus. As of right now there is no policy in place, but they are suggesting making it policy to have mother's fold their strollers if they want to ride the train or the bus. The MBTA even goes as far as saying that "the number one complaint I've had...is strollers." Not running off schedule? Not waits in tunnels? Not people taking up two seats? Not giant backpacks swinging around that could kill a small person? The MBTA is now suggesting that parents remove their children from the stroller, remove their bags from the storage space under the stroller, fold the stroller, carry the bags, carry the stroller and of course, carry your baby or hold your child's hand. Apparently they think all mothers are Superman (why wouldn't we just fly places then?). The thought of having to do all of this will make me never ride on the MBTA with a child, unless they are old enough to walk on their own. This makes me sad for all parents who rely on the MBTA as a means of transportation daily. Like I said, I understand the other side of this, but I don't see how it justifies a precedence being put into place. If you can fold your stroller easily, then you should fold it up, or get it out of the way. If you can't, apologize to others and let them deal with it. Before anything is set in place, they would like to launch a pilot program that would require anyone with a stroller to fold it before entering the bus. They then go on to say that this would "require passengers to stow their carriages"...where I ask you?? Have you seen the size of them folded? Isn't this becoming a safety issue now? These giant metal contraptions will just be flailing around the bus/T bumping into people! I would love for you all to read the article by clicking here and to weigh in in the comment section with your opinion on all this. Would love to hear from both sides! 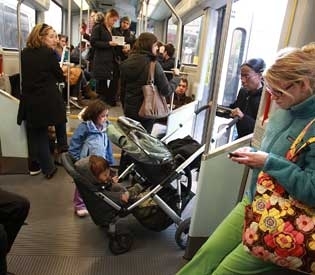 If you make taking the T impossible (or nearly so) with young children and their care takers you are therefore teaching those kids that public transportation isn't for everyone. That's a bad lesson and bad for our future community and bad for the MBTA. Thanks for sharing this! I can't believe they're actually considering this! This is already the policy in NYC transit. Taking a double on the T is crazy.. thankfully I too live in the burbs now and drive, but I'd have my 3 year old walk and carry my 1 year old in the LilleBaby if we lived back in the city. The few times we did take the T with our stroller (when my son was just born) I was so angry to learn there are no elevators at Government Center! I wonder if that has changed? I like the suggestion of designating certain cars as stroller friendly - that way you always have choice (whether you have a stroller or hate the strollers). From getatable buses, trains, and devotion, to a world-class paratransit run, the MBTA is sacred to providing fantabulous pairing to customers of all abilities. We are try to embellish the spheric touchstone for comprehendible national transportation-creating a method that is innocuous, sound and inclusive, thereby expanding the conveyance options getable to all our customers, including those with disabilities. Superior one of the links below to discover author around convenience at the MBTA. Nice information, valuable and excellent stroller design, as share good stuff with good ideas and concepts, lots of great information and inspiration, both of which we all need. I want to buy like this one for my baby. i will check this out. Thanks for all the enthusiasm to offer such helpful information here. Wow. This stroller is very useful in carrying my baby. I will purchase this kind of stroller soon. Anyway, I will add this site to my favorites. Keep it up. This is old, I realize, but I'm venting. I used the T when my kids were small. I also had a cheap umbrella stroller that folded-- really-- to a size close to that of an umbrella. I still ride the T 20 years later, and am so damn sick of being pinned in the corner by hummer-size contraptions and rude mothers. It's just so unnecessary. Get a little stroller, fold it up and maybe hold the kid on your lap. I'm about to go to Boston and hoping to take my twin babies downtown for one day. Just one day. And twins = mom can't carry them nor fold the stroller. After reading some of these comments, I feel I would be very unwelcome in Boston. The information in this blog is extremely useful for the baby's mother. Great post. There's a whole lot of great items on here for baby. Thank's for sharing. ow! great tips for baby stroller. Because I know what that commitment is and what that job entails, it is just not the right place for me right now. I really am enjoying what I'm doing. As far as what will happen in the next few years I can't really say, but like I said, I will always be close to the game.". United in 2009. gym t shirts Circles. He was The Post's All Met Player of the Year in the fall of 2006 and won an NCAA bachelorette party shirts championship in his second and final season at the University of Maryland. 30, 2018, against San Francisco with a knee injury. Gurley will miss the Rams' final two games of the regular season due to the injury, but McVay says he isn't concerned about the star running back's availability for the playoffs. (Jae C.